CVT transmission and how they fit in this day and age, with our natural resources dwindling and the Global warming fear ever increasing, car designers are turning to more efficient ways of making cars operate. One way car manufacturers are doing this is the CVT (CONSTANTLY VARIABLE TRANSMISSION). The conventional transmission (non CVT type) has multiple gears, and changes these gears automatically to help the car speed up and slow down in harmony with the engine. The modern CVT transmission is really quite different as it has no gears to speak of at all. 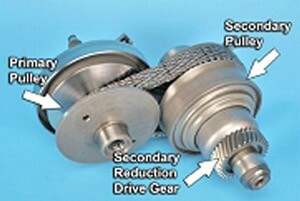 Instead, it has a series of pulleys and usually uses a type of metal belt (kind of like a chain) to control the shifting .The vehicle computer (and sometimes a transmission computer as well) is always adjusting the pulley sizing which is based on road speed and how much throttle input you are applying. This continual adjusting of transmission pulley size (similar to changing gears) is done seamlessly to the keep the engine in its best operating range for fuel economy and power. This continual management of engine speed is something not possible with conventional automatic, or standard transmissions. The main drawback of this pulley sizing & adjusting is it makes the transmission work very hard and in some cases causes it to breakdown. When that happens the trans-mission may not perform as it should causing it to feel like it’s shuddering, bucking and not working properly. To prevent costly breakdowns, we suggest changing the fluid regularly- even more frequently than many manufacturers suggest. If you have one of these CVT transmissions in your vehicle, and are experiencing some of the driving concerns mentioned above- a transmission fluid change should take place immediately. This may not always fix the problem but is certainly a good first step in identifying a potential transmission issue. If you have any questions or wish to book an appointment to have your CVT transmission fluid changed, please give us a call or e-mail us here at the shop.